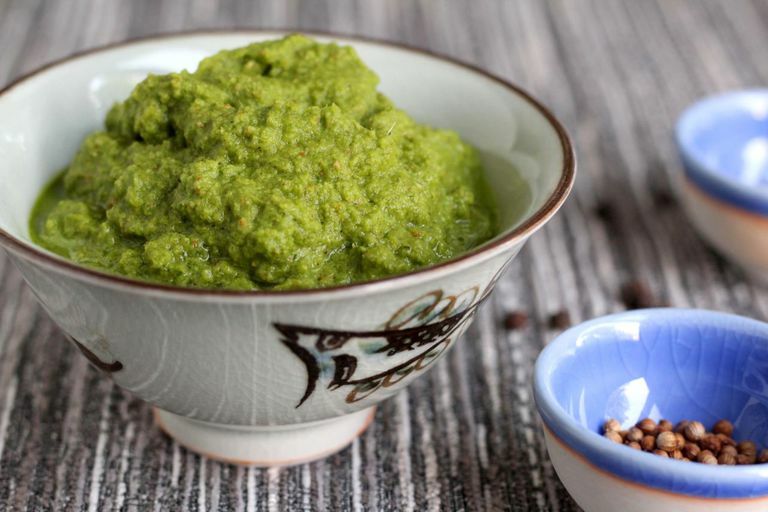 Fresh green chiles and green herbs distinguish Thai green curries from red, yellow, and other curries. That makes green curry an especially good candidate for low-FODMAP cuisine ​since these assertive fresh flavors (along with freshly ground spices) can carry the day in the absence of fresh garlic and shallots. In a heavy skillet over medium heat, toast the cumin and coriander seeds until they become fragrant and darken slightly 3 to 4 minutes. When cool, finely grind the seeds and the peppercorns. Trim off the bottom end of the lemongrass stalk. Peel off the outer, green leaves, revealing the yellow core. Starting at the bottom end, cut the lemongrass into thin slices, stopping about halfway up the stalk or when the core seems to end. Add the spice mixture, lemongrass, fish sauce, and oil to the bowl of a blender or food processor. Next, add the lime zest, cilantro, chile pepper, ginger root, and scallion greens. Process until a paste is formed, using a tamper as needed to push the ingredients toward the blades of the blender. Use or freeze promptly. Ground cumin and ground coriander seeds can be substituted instead of roasting and grinding your own seeds. Toasted spices can be ground in an electric spice grinder or coffee grinder, a mortar and pestle, a food processor, or a hand-cranked pepper mill. One recipe of this paste stirred into a 14.5-ounce can of coconut cream will season a pound of chicken and several cups of vegetables. Because it is not as concentrated as commercially made curry paste, we recommend you use twice as much as may be called for in recipes. Leftovers freeze very well in small jars. Or, divide the curry paste into an ice cube tray, pop out the frozen cubes, and store them in the freezer in an airtight container.